Brenton Ford is not your typical Internet marketer. He has diligently applied James Schramko's news blog process called OTR to his unique field of business with great results. Listen in and learn how Effortless Swimming improved sales and popularity by owning the racecourse. James: James Schramko here and my guest today is Brenton Ford, welcome Brenton. Brenton: Thanks James thanks for having me on. James: It’s my pleasure. Now I’m interested in talking to you and I’m doing this beside my pool today and there’s a reason for that. It’s because of your business. You’re not in the typical internet marketing space. You’re in a different industry all together. Would you like to tell us a bit about what you’ve been doing online? Brenton: Yeah, well last 3 – 4 years I’ve built an online based business around swimming and teaching trackletes and swimmers how to swim faster. So it’s not your typical internet marketing, make more money online, type of business I guess. James: Right. You’ve been applying some of the things that we talk about on Internet Marketing Speed such as video marketing and podcasting and membership sites. Can you give us a little helicopter view of what your business looks like at the moment? Brenton: Yeah well I started out with one product, one website and not much of an idea of what a business looked like. I had a website but it wasn’t a business. But meeting you a couple of years ago, you taught me how to build a business from my knowledge and what I knew so I’ve sort of built this thing out to encompass a lot of things but based around the Own the Racecourse thing that you’re teaching at the moment so I’ve got a number of different products. They’re digital products, they’re not DVDs, they’re not physical, they’re all digital download. I’ve got a membership site. I’ve got another recurring product as well. A lot of similar stuff to what you’re doing I guess. It’s just building up the whole business with an email list, a blog and doing weekly videos and having more than just a website I guess and having a proper business. James: Alright so with Own the Racecourse, you’ve referenced that as a course that I put out and you actually attended a workshop that we did where we stepped through how I was applying that to my business. Would you say that the strategy that I’ve deployed there with the news blogging is suitable to non-internet marketing industries? Brenton: Yeah, absolutely. I’d say it works tremendously well in industries that aren’t internet marketing. What I started 3 or 4 months ago after I saw you doing it and you made a suggestion to try it was every week, on a Monday, I film a video where I give away a few tips about swimming and I talk about what’s going on with Effortless Swimming which is my business and I let people know about any new products or clinics or it’s just basic news about what’s happening in the business and in October the business had its biggest month by 45% largely because of this Own the Racecourse system. So I’ve been doing that for the last 3 – 4 months and the email list has grown tremendously. I’m not sure exactly how much but it’s up to 4 – 5,000 subscribers, the Facebook fan page is up from 4,000 about 2 months ago to about 15,000 and I’m getting a lot of people email me asking for coaching services and getting a lot more sales and that sort of thing and it’s all by building my personal swimming coaching brand through these videos and through these weekly videos that I’m putting out. 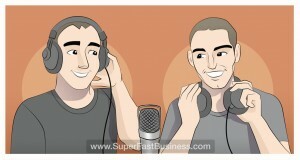 James: Are you contacting your customers more than you used to contact them? Brenton: Earlier this year I don’t think I sent out an email for 3 or 4 months. Because I didn’t want to bother my customers or bother the people on my email list. But in hindsight that probably wasn’t the best move and I’ve been sending out an email ever week or every couple of days depending on what list they’re subscribed to. But the amount of replies I get to my emails has increased because people are thanking me for the videos, they’re asking me questions about their technique and about the products. I haven’t had 1 person say to me that you’re emailing me too much. They’ve all thanked me and told me that they’re looking forward to these videos coming out each week. It’s counter intuitive to what I thought would be the case where people were sick of hearing from me but because I’m not sort of pushing things on people, I’m just giving them some helpful tips that they can implement for the week. It’s really been a different result to what I was expecting. James: Right, so if I’m reading between the lines here, you have overcome your trepidation to email your customers and you no longer fear that they’re going to leave your list because you can feel good about giving them more and more value. Like the more often you contact them, the more good stuff you’re teaching them that’s going to help them with their swimming. Brenton: Yeah that’s the thing, because I was used to all these internet marketers who every week or every day it’s a different offer for a different product. And that’s not the type of business I want to be running. I was sort of thinking, well that’s the only way that you can email customers every day but turn that around. Give them something that they can use, not something that they should buy. Just give them free tips, free news and they’ll appreciate it. James: Well word on the street is that some of these internet marketers have been adopting the Own the Racecourse strategy in the last few months. So it should be interesting to see these patterns crop up. So just for a listener who might not be familiar with an Own the Racecourse strategy, could you just step us through like your typical weekly schedule. Like what do you actually do once a week with your blog or your news outlet? Like what are the steps for them? Brenton: If I was to do nothing but the Own the Racecourse model which is every Monday, I will get out my camera, I’ll take it out to the kitchen and I’ll plug in my microphone, I’ll grab the whiteboard, I write down 4, 5 or 6 points that I want to talk about and then I hit record, I’ll go through those couple of points, I’ll stop the recording, take out the SD card, put it in my computer and edit the video and then upload it to YouTube. Then I’ll send that off to my assistant over in the Philippines, Gwen. Hello Gwen out there, I’ll send her this recording. What she’ll do is she’ll get it transcribed, she’ll put together bullet points, and then she’ll upload it to the blog and then she’ll send that to me and then I’ll send that out to my email list. I’ll post it to Facebook, to Twitter, to Google+. If I did nothing but that for the week, I’d still get 80-90% of the results for the week I’d say just from doing that 1 video on a Monday. It really is the 10% work and 90% results. James: I’m glad you said that because some people say to me, “Gosh that sounds like a lot of work but it makes so much sense.” Then I ask them, “What other marketing they do to drive their business and really where I’ve got it to and where it sounds like you’ve got it to is if you do nothing other than pop out a video here and there, that that will actually continue to drive your business and not just drive it but grow your business bigger and it’s probably going to have a compound effect I imagine if the same thing that’s happened to me is you’ll build your audience and you start getting more comments and people find you in the different channels as well. You’re tapping into a few different places. Sounds like Facebook’s really kicking and your YouTube channel I imagine would get embedded and shared occasionally by other people. Brenton: Yeah that was the thing. I got off the phone to someone who I did a podcast with today and he said to me, “How on earth have you got this video onto so many different websites?” because he must have come across it on some triathlon or swimming websites. And all that is is other people are embedding the content onto their own websites. Because it’s good content, they want to share it and they want to I guess add things to their blog. So it’s not rocket science. But just doing the day in and day out things and doing this video every week, it’s really having a compound effect on sales, on the email list, on building authority and getting the (inaudible 09:09). It’s not hard. I wouldn’t call it work either. I enjoy making the videos. Every day I’m thinking of new things to talk about in the video and I’m kind of scratching to, itching to get out there in front of the camera to get this stuff in front of the people who watch the videos because I know it’s good stuff. James: What sort of challenges have you had in setting up this new system apart from your own fear that people might say, “Hey look, you’re sending me too many emails but have you had any technical challenges or major fears or obstacles to overcome? Brenton: Nothing too major. I mean, I was pretty rubbish in front of the camera to start with. I was pretty serious. I got told by someone that I looked like I was in front of a firing squad. So maybe smile a bit more. Yeah, that was good advice. I tried to smile more since then. But it’s gotten a lot easier and initially when I started my business, you see the internet marketing business where it’s a guy sitting behind his computer making all this money and no one knows who he is. So he’s this underground type of guy. That’s sort of what I wanted to set up, in the beginning that’s what I thought was the way to go because I didn’t want to… I was afraid of being known out there. I’ve sort of changed that around and now I’m really putting my face out there and getting my name out there and people can relate that way. They’d rather deal with a person than a business especially in the swimming triathlon market. I had those sort of issues at the start. There are always technical issues like you might forget to turn the microphone, the SD card might be full so you need to record the video again, but just get it done and these technical issues become less and less as you get more experienced with it. But it’s nothing major. If the video quality is not that great at the start, I would just put out some not great quality videos, the content’s been good but the quality’s not great, but people would rather get the content than not receive it I think. It might look ugly but it does the job. James: Yeah, I’ve definitely put out my half-done videos before but I think people forgive you when you’re starting out on this and besides that, you don’t have as big an audience when you start but certainly as the audience grows, you can refine your technique. You’ve been really generous sharing your story there, Brenton. I wanted to ask you, can you give the listeners some action steps. What can they take away from this? If they’ve got a website or they have a business, it may not be in the internet marketing space, maybe it’s a normal sort of business or they have customers who are in a traditional sort of business, what are the things that they should focus on first? Brenton: If I looked at my business and I had to keep only a handful of things; it would be my website, so EffortlessSwimming.com which is the main website where I add these videos to each week. It would be my email auto responder. I use Office Autopilot but it doesn’t matter too much what system you’re using as long as you’ve got somewhere where you can collect people’s email addresses and keep in contact with them. It would be a Facebook fan page, it would be a camera, and a YouTube account. If I had just those things, I think I could do pretty well with the business. So if someone’s looking to increase their business or increase their revenue, get their name out there, build more authority in the market. Then just start recording a video once a week. Just write down a couple of points on a whiteboard, film yourself, put it out there, put it on your website, put it under Facebook and just start building this following because if you’ve got something to say, and you know what your market is looking for then they want to hear this kind of stuff. I was going on Facebook today and I saw a friend of mine who’s in financial planning. She put out an article that was on one of the websites that she writes for and I was just browsing on Facebook and I looked at this thing and I thought this is great so I sort of saved it to read for later because people want to consume content that they’re interested in. Put your fears aside, if you don’t want to get on camera and just do it. It might be painful at the start but it’s been so worth it for me and my business. James: Awesome. Now if people want to see what you’ve got going there and check out the swimming videos, learn how to swim better and eat better and get that sportsman brain, where can they go and have a look at your stuff? Brenton: When you’ve got the million dollar house and the pool at the backyard from your internet marketing then head to EffortlessSwimming.com and that’s where I put all my content. You can check out what I’m doing in terms of the marketing side of things. If you’re a swimmer or triathlete then get in touch and we’ll improve your swimming so you’re not left behind on the swimming leg of your triathlons. James: Fantastic. Now I’ve just got another question. Actually I hadn’t planned this but what would you say to someone thinking about coming on board with SilverCircle? Brenton: As you know I’ve been part of SilverCircle for, well I’m kind of thinking how long now, but it’s been over 12 months and what I get out of it is the accountability is great because every week we say what we’re going to do and then we reference that the next week to actually see what we’ve been through and then just your experience has sort of guided my business in the right direction and it’s kind of pushed me to do more than I would just by myself. For example running freestyle clinics and workshops. The very first one I ran I was so nervous about having 20-30 people in a room where I’m talking about swimming. But you just kind of encouraged me to go ahead with it and that was awesome. It got me over my fear of talking in front of 20-30 people about swimming and then also the other business owners in there and the forum. There are a lot of different businesses and a lot of experience in there. And you can throw around ideas and people will get back to you with what they know and what they’ve been through. It’s been responsible for driving my business tremendously and there’s no way I’m leaving it any time soon. James: Nice, well thanks Brenton I hope people go and check out your swimming videos. This is definitely the sportiest episode I’ve ever recorded. I can see a racing bicycle in the background there and the pool over here. Hopefully you’ve inspired some athletic… and it’s Christmas in Australia as well, for our overseas listeners. There’s the surf board for all the people in the snow right now. Thanks mate. Have a great week. I’ll catch up with you on the next call.